Seattle’s Roosevelt neighborhood sits on the northern regions of the city. While mainly a residential neighborhood, Roosevelt still features plenty of shopping, restaurants and recreational destinations. Roosevelt Square is home to local and family owned businesses as well as nationally recognized names such as Whole Foods and Starbucks. One renowned restaurant, named Sunlight Café, has been a local favorite since 1978. To enjoy the great outdoors, visit Cowen Park. This gorgeous park space encompasses the ravine which the Ravenna Creek flows through. With plenty of history and relaxed charms, Roosevelt is a perfect retreat and a lovely place to call home. Boasting a Whole Foods , 2 parks, Roosevelt High School, and a number of fantastic local restaurants, pubs and coffee shops, Roosevelt is an easy place to call home. You’re also a quick 10 minute drive into the heart of Downtown Seattle and just minutes from everything else Ravenna has to offer. Our Roosevelt apartments can offer communities amenities such as a fire pit, BBQ grill, and a media room. Individual apartment amenities can include expansive windows, washer/ dryer, and quartz countertops. 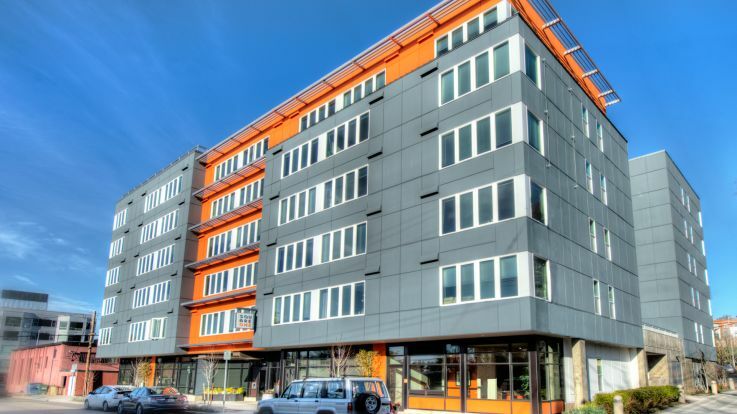 Check out all of our other Downtown Seattle apartment communities if you can’t find exactly what you’re looking for in our Roosevelt apartments.